Last month, Grantbook celebrated its seventh birthday. That’s seven years of partnership with foundations large and small, public and private, in our own backyard and around the world. It’s safe to say our team of advisors and implementation specialists have learned a thing or two about grants management over the past seven years. 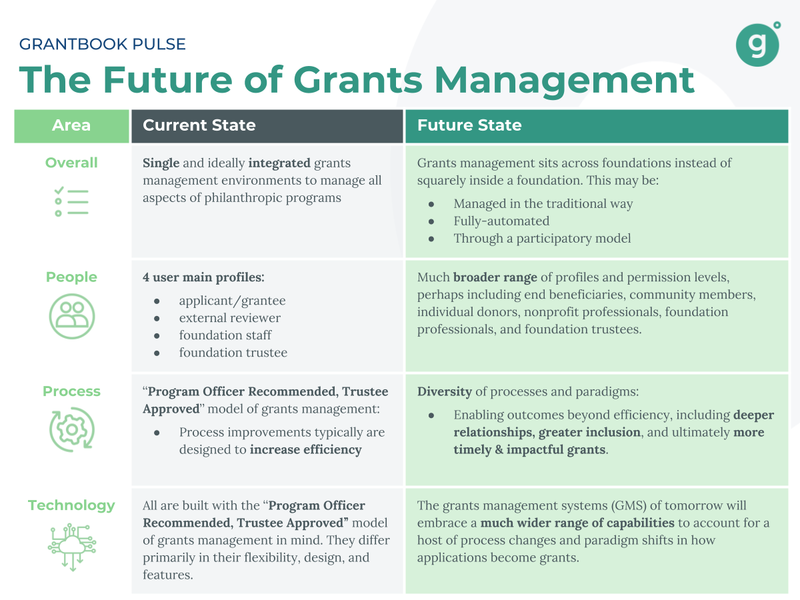 As we recently found out in a team exercise imagining our future, our hands-on experience helping foundations operationalize their missions has also afforded us a very educated glimpse into several paths forward for grants management. In future posts I will unpack other ideas from our imagined futures, however, for this post, I want to paint a broad picture of the future of grants management. The summary below brings together thinking from our visioning exercise and thinking I’ve been doing in response to Adam Liebling’s excellent post, From Procedural to Principled: A Short Recent History of Grants Management. Adam’s post prompted me to take a stab at articulating what the future of grants management may hold. Foundations today create single and ideally integrated grants management environments that allow them to manage all aspects of their philanthropic programs in a way that’s aligned with organizational mission, strategy, and values. The majority of today’s grants management environments account for a standard set of 4 user profiles: applicant/grantee, external reviewer, foundation staff, and foundation trustee. The foundation staff role typically breaks out into program officer, grants administrator, program officer, communications officer, senior management, and trustee. Today’s grants management systems, despite their differences, are almost all built with the “Program Officer Recommended, Trustee Approved” model of grants management in mind. They share common elements and differ primarily in their flexibility, design, and features. * More concerning, the dominant paradigm of “Program Officer Recommended, Trustee Approved” grants management results in all kinds of inefficiencies and hubris summarized incredibly succinctly by ex-Rockefeller Foundation Program Officer, Antony Bugg-Levine in Questions I Wish I’d Asked. His article outlines 7 deep questions that for some on the grant seeking side are self-evident but for those on the grantmaking side require courage to ask. Grants management of tomorrow will be a function that sits across several foundations instead of squarely inside a single foundation. A foundation’s mission will be operationalized through the types of grants management environments it participates in. Some of those environments will be managed in the traditional way. Others will be fully-automated. And still others will embrace a deeply participatory model for determining how an application becomes a grant. Grants management environments will need to account for a much broader range of profiles and permission levels. In any one environment, everyone from end beneficiaries, community members, individual donors, nonprofit professionals, foundation professionals, and foundation trustees will need to be represented. The future of grants management will be defined by the diversity of processes and paradigms it can support. This diversity will enable outcomes that extend beyond efficiency to include deeper relationships, greater inclusion, and ultimately more timely & impactful grants. The Johnson Center’s 11 Trends in Philanthropy for 2019 report (See Trends 1, 5, 7, and 8 in particular) reflect this shift toward participatory and networked philanthropy. The 2018 Philanthropy Awards, participatory philanthropy was named the Most Promising Sector Reform Effort. In January 2019, Fluxx released a white paper entitled, Connected Philanthropy: A Platform for Impact in Philanthropy that anticipates the marketplace-enabled GMS described below. The press release announcing the merger of GuideStar & Foundation Center into Candid.org also highlights the role that the newly formed combined entity could play in more thoroughly connecting sources of philanthropic data to enable better outcomes. The press release announcing Salesforce.org’s acquisition of foundationConnect made a similar point. 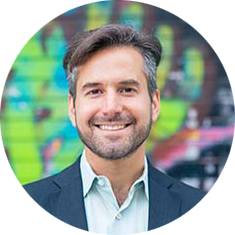 The Grantbook team believes that participatory and networked philanthropy could lead to exciting new breeds of grants management systems or, for the near future, the piloting of these concepts via creative implementation of existing solutions (GMS or otherwise) or a unique integration of multiple solutions. Funder Collaborative Grants Management System (collabGMS) - As funders recognize their common objectives, they will participate in more and more funder collaboratives. Some of those collaboratives will initiate collaborative-specific grants management mandates that enable co-funding workflows and payment processing. Marketplace-Enabled Grants Management System (marketGMS) - A greater number of GMS solutions will have marketplace capabilities built-in or options to integrate with marketplace solutions like Shopify, Big Commerce, or Magento. This capability will, enable funders to transform their closed systems for managing a private process into a public or semi-public space that invites other funders and individual donors to “subscribe” or “piggyback” on the due diligence and decisions coming out of those funders or independently fund applications that are runners up or declined. 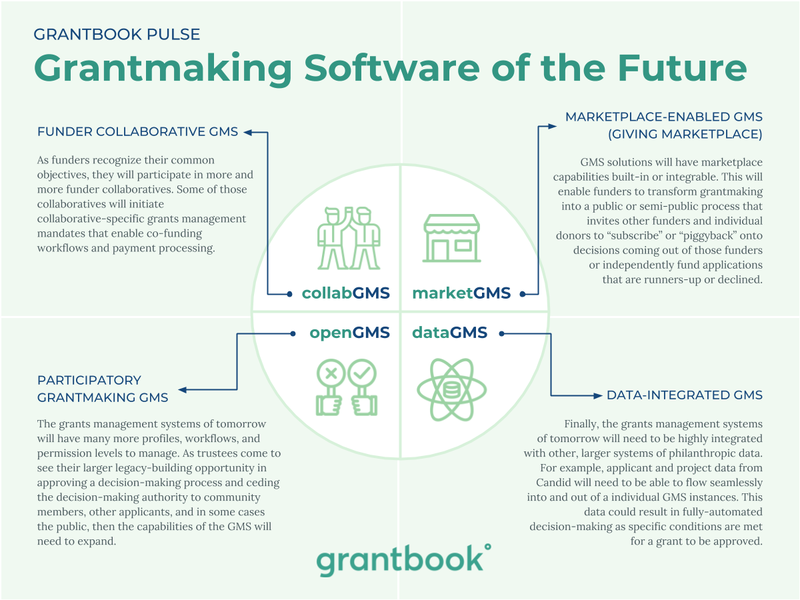 Participatory Grantmaking Management System (openGMS) - The grants management systems of tomorrow will have many more profiles, workflows, and permission levels to manage. As trustees come to see their larger legacy-building opportunity in approving a decision-making process and ceding the decision-making authority to community members, other applicants, and in some cases the public, then the capabilities of the conventional GMS will need to expand. Data-Integrated Grantmaking Management System (dataGMS) - Finally, the grants management systems of tomorrow will need to be highly integrated with other, larger systems of philanthropic data. For example, applicant and project data from Candid will need to be able to flow seamlessly into and out of an individual GMS instances. This data could result in fully-automated decision-making as specific conditions are met for a grant to be approved. Previously, I’ve written about the long-game opportunity for innovators in philanthropy. As the philanthropic sector evolves, the Grantbook team welcomes opportunities to pilot new and different ways of doing grants management so we can continue to deliver trusted, meaningful, and transformational service to the sector. Specifically, we want to pilot projects today that test the power of participatory and networked grants management in order to respond to the demands of philanthropy of tomorrow. Curious to learn more about Grantbook innovation? Reach out to us at hey@grantbook.org if you have ideas you'd like to collaborate on! In 2010, Peter set two ten-year goals for himself. One was to become more musical. The other was to create a successful social purpose business. For the first, he chose to learn the fiddle. For the second, he partnered with Anil Patel and together they committed themselves to helping foundations improve their relationship with technology. That commitment became Grantbook.